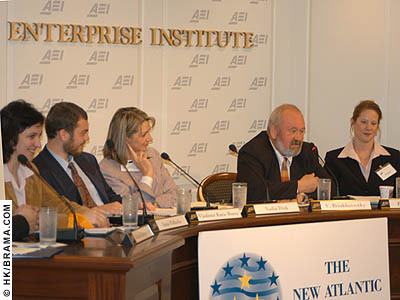 On Friday, December 10th, the American Enterprise Institute (AEI) held a conference entitled "Ukraine's Choice". The conference attempted to assess Ukraine's geopolitical orientation, civil society, and economy after the presidential elections. 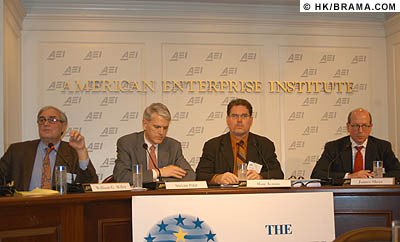 The AEI is one of the largest public policy think tanks in Washington, DC. The conference was also sponsored by the Friedrich Naumann Foundation, Freedom House, the International Republican Institute, the National Endowment for Democracy, and Radio Free Europe/Radio Liberty. Among speakers were well know politicians and researchers such as Zbigniew Brzezinski, Radek Sikorski, Vyacheslav Briukhovetsky, the chief of staff for Viktor Yushchenko Oleh Rybachuk, Adrian Karatnycky of Freedom House, and others. When planning the conference "Ukraine's Choice: Europe or Russia?" 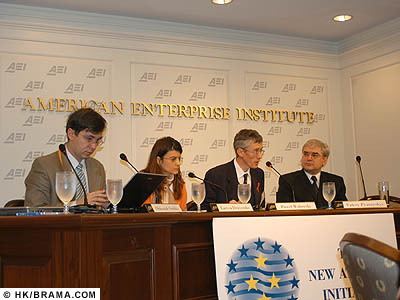 the organizers at the American Enterprise Institute did not realize how timely and weighty the conference would be. Undoubtedly, the conference speakers had to revise their presentations due to the constantly changing situations in Kyiv. 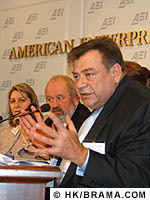 The conference covered such topics as Ukraine's economy, civil society, armed forces, and geopolitics. A video from recent BBC coverage of the Ukrainian crisis opened the conference. This highly informative video represented the viewpoints of both sides in the political conflict. However, the producers of the video made the same mistake as many western informational and academic sources often do. The video claimed that the source of the crisis is the division between Eastern Ukraine (Orthodox, Russian speakers, supporting integration with Russia) and Western Ukraine (Greek Catholic, Ukrainian speakers, supporting integration with the EU). This cliche was undermined during the 17 days of widespread protests in Ukraine where people from the East played a large role. The participation of both Ukrainian and Russian speaking people justified and legitimized the call of the crowd "for democratic changes" (instead of "for the interests of western Ukraine", as some think). Therefore, the source of the crisis is the conflict between democratic and authoritarian forces, rather than the conflict between western and eastern Ukraine. Are Events in Ukraine Capable of Influencing Neighboring Russia, Belarus, and Moldova? What is the Nature of This Influence? As Samuel P. Huntington once urged, the democratic transition in one country could launch similar transitions in other countries of the region. The majority of speakers at the conference, including Professor Vyacheslav Bryukhovetskyi from Kyiv Mohyla Academy and Adrian Karatnycky from Freedom House, agreed that Ukraine will become such a catalyst for the Commonwealth of Independent States (CIS). Only on how soon the changes would come did opinions differ. In his speech, Dr. Brzezinski was confident that the Ukrainian "Orange Revolution" would boost Russian opposition and lead to democratic revolution in Russia. If not for being such an experienced real-politics player he would be accused of being too naive and idealistic. But Dr. Brzezinski seems to be right. Indeed, the presence of representatives from Russian, Belarusian, and Moldovan opposition forces at the conference was quite noticeable. Their speeches and comments were nurturing a hope for democratic changes in their countries. Vladimir Kara-Murza, co-founder of the "Free Choice 2008 Committee of Russia" declared: "Freedom will come to Russia; maybe not next year, but we are hoping for 2008 [the year of presidential elections in Russia]." Someone from the audience noted that "the parliaments of Kyrgyzstan, Moldova, and Belarus were closely watching current events in Ukraine." James Sherr from the UK Defense Academy, added: "It shows them the possibilities of what could be accomplished." 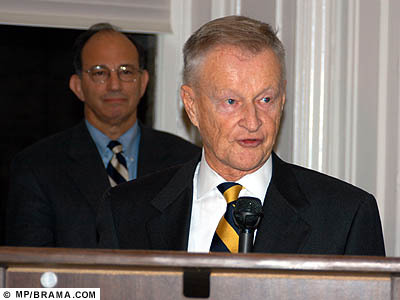 Zbigniew Brzezinski, trustee and counselor, Center for Strategic and International Studies spoke at the reception held at Freedom House later that evening. 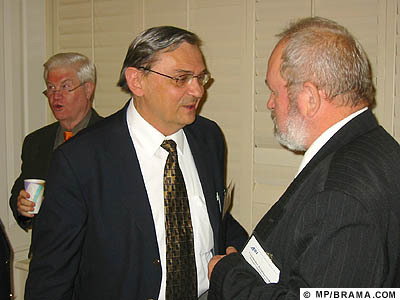 Thomas Dine, president of Radio Free Europe/Radio Liberty is standing behind Mr. Brzezinski. Dr. Brzezinski distinguished three phases of the recent waive of democratization in Eastern Europe and CIS; the Warsaw phase, the Vilnius phase, and the Kyiv phase. The Kyiv phase is characterized by its soft constitutional transition from an authoritarian to a democratic regime. As Professor Bryukhovetskyi put it: "Ukraine showed how to make a revolution without a violation of the Constitution." The next four to five years will show whether the Ukrainian 17 day transition will become the first peaceful constitutional democratic transition in CIS or the only of its kind. Panel: Ukraine's Economy: Converging with the European Union or with the Common Economic Space? 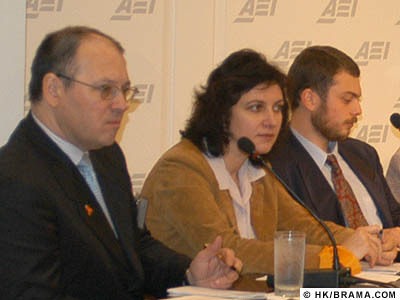 L-R: Oleksandr Sushko, director, Center for Peace, Conversion, and Foreign Policy of Ukraine; Larysa Denysenko, program director, Transparency International–Kyiv office; Pawel Wolowski, director for Ukraine, Center for Eastern Studies in Warsaw; Valery Pyatnyskyi, first deputy minister of economy and European integration of Ukraine. Pawel Wolowski, director for Ukraine at the Center for Eastern Studies in Warsaw, noted that irrespective of the outcome of the elections, Russia would remain a major economic partner of Ukraine. Healthy economic relationships should benefit both. However, Ukraine should implement an energy security strategy to protect itself from Russian attempts to manipulate the Ukrainian economy. Oleksandr Sushko, director of the Center for Peace, Conversion, and Foreign Policy of Ukraine, noted that according to Russian sources, 40 percent of Ukrainian economy belongs to Russian businesses. He subsequently added that "it was an overestimation but close to the truth." However, he was confident that such a high involvement of Russian capital in the Ukrainian economy "is not a threat to the GDP and national security." 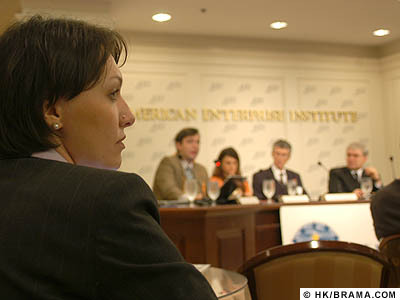 Larysa Denysenko, program director of the Transparency International Kyiv office, stated that some articles of the Single Economic Space Treaty do not correspond to the Constitution, the Agreement on Partnership and Cooperation between Ukraine and the EU, as well as Ukraine's commitment to adopt its legislation to European standards ("Acquis Communnautaire"). Nevertheless, the Parliament ratified the Treaty violating the Constitution and several international commitments Ukraine had made. Moreover, Valery Pyatnyskyi, First Deputy Minister of Economy and European Integration of Ukraine, underlined that "the Single Economic Space, as a quasi-state creation, does require a referendum." Thus ratification of the SES Treaty without a referendum violates the Constitution as well. As to the fight against corruption, Sushko emphasized that "corruption in Ukraine is an essence of the system...Even if Yushchenko is an angel, I do not expect victory over corruption in the nearest future. It is a structural problem." Thus, Sushko underlined that only structural changes, rather than treaties and declarations, could help the Ukrainian economy. Finally, Pyatnyskyi affirmed that the negative impact of the current crisis on the economy is not a major concern. "Although some populist decisions were made destabilizing the financial situation, Ukrainian economy is flexible enough to deal with it next year." Do Recent Protests Indicate the Formation of a Ukrainian Civil Society? What are the Positive Developments of Recent Weeks? What are the Future Risks for the Development of a Civil Society in Ukraine? Until recently, academics and politicians alike had questioned the existence of a civil society in Ukraine. The two weeks of nationwide protests have changed everything. As Nadia Diuk, director for Central Europe and Eurasia at NED noted, "what happened in Kyiv during the last two weeks was the flourishing of a civil society." Inna Pidluska, President of the Europe XXI Foundation, also stressed that "[in Ukraine] civil society is not a question anymore." The extensive public protests and vast opposition support stunned not only outsiders, but also the leaders of the opposition itself. Karatnycky noted: "Opposition elites expected 50,000 or so protestors. They were surprised by the vast public and institutional support." Moreover, Briukhovetskyi and Diuk pointed to other important developments such as the birth of a middle class and the birth of a modern national identity. Briukhovetskyi noted: "Today we are enjoying the fruits of the evolution process of the Ukrainian nation." So, what was the impulse for the building of public resistance, and when did it happen (was it given)? According to Roman Kupchinsky, former director of the RFE/RL's Ukrainian Broadcasting Service, "Without the Melnychenko tapes, the revolution would not be of that magnitude." The "Ukraine without Kuchma" movement that was formed in reaction to the Gongadze case built up the resistance. Although later it failed, it gave birth to the consolidation of civil sources for the future." Karatnycky also supported this idea adding that media outlets, i.e. - internet, SMs, cable and local TV, etc. - helped the transformation of the civil society as well. Pidluska and Diuk highlighted some positive developments of the recent three weeks. Achieving the rule of law in Ukraine is one of them. The fact that the Supreme Court and the Parliament played a big role in settling the crisis indicates that the government resources started protecting the people's choice. The development of non-government organizations is another positive development of the recent events. Pidluska noted that the growth of volunteer movements, NGOs, civil and grassroots initiatives, and civil monitoring groups indicates that people have started engaging into the political process. 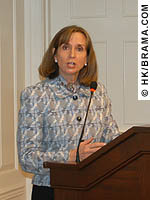 She also underlined the importance of development of educational resources for mobilization such as "Znaiu" ("I Know"). L-R: Inna Pidluska, president, Europe XXI Foundation; Vladimir Kara-Murza, cofounder, Free Choice 2008 Committee of Russia; Nadia Diuk; Vyacheslav Briukhovetsky, National University of Kyiv–Mohyla Academy; Paula Schriefer, director of programs, Freedom House. Paula Schriefer, director of programs at Freedom House, commented on the extent to which foreign organizations facilitated the formation of NGOs and a civil resistance in Ukraine. "We bring democratic values and funding for 1000 nonpartisan monitoring groups in Eastern Europe and the CIS. Still, it is amazing that a country of 48 million responded so well...What is happening in Ukraine is in no way implemented by the West... Every single slogan on flags, banners, and posters was developed by Ukrainians, not by the West." Further, Pidluska warned that "the victory is not preserved" and some major risks are yet to come. "Society remains relatively weak and there seems to be no plan to strengthen it...Ukraine is still an ethnically divided society. The development of policies to unite society should be the first priority of the next president... In the long term, the government should develop an effective 'public - authorities' dialogue." 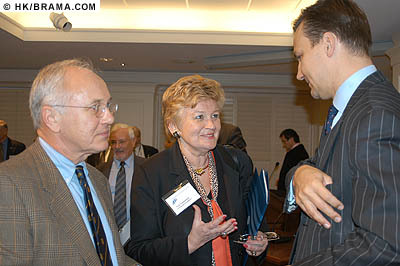 L-R: Adrian Karatnycky, counselor and senior scholar, Freedom House; Inna Pidluska; Vladimir Kara-Murza. So, what does the future bring for the civil and grassroots movements? Karatnycky warned that some NGOs will fragment. He noted that most Ukrainian NGOs are based on immediate resistance to authoritarian power, they do not have enough capacity to influence the policy making process on a routine basis. Thus, due to the lack of forces to resist, some NGOs will vanish, other will survive as watchdog groups. There will be an increasing necessity for NGOs' transformation. What is the Possibility of Separatism in Ukraine? Will Ukrainian Armed Forces Go Against Demonstrators? What are the Prospects of NATO Membership for Ukraine? What are the Security Concerns in the Region? Panel: Ukraine's Armed Forces: On the Way to Join NATO? James Sherr discussed one positive and one negative Soviet legacy related to the armed forces and the foreign policy issues. The first legacy carried by both Russian presidents and Kuchma is the principle of "divide and rule." The second legacy is that the Ukrainian armed forces were "designed to protect the country from foreign invasion, not to intervene into the internal political process, and not to protect the country from its people." Igor Kozii, Head of the General Staff of the Ukrainian Armed Forces at the Department for Euro-Atlantic integration, also rejected the possibility of Ukrainian armed forces taking action against the Ukrainian people. Further he denied any chance for the separatist measures in Ukraine. In relation to NATO membership, Sherr stated that "Ukraine has all the conditions to be a strong applicant." Yet, Sherr and Kozii warned that the lack of money for Armed Forces reform could become an obstacle for Ukrainian membership. Sherr proposed establishing a team of experts who could reassure NATO of Ukraine's willingness to join. 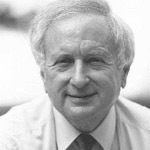 L-R: William Green Miller, former U.S. 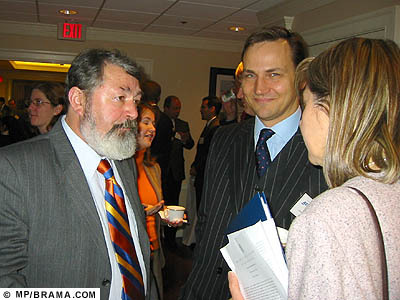 Ambassador to Ukraine; Steven Pifer, former U.S. 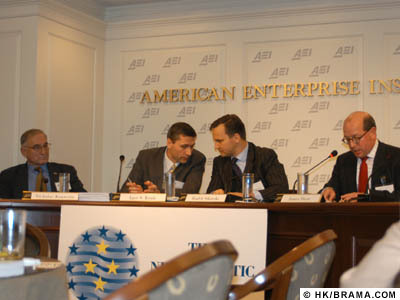 Ambassador to Ukraine; Ron Asmus (Moderator), German Marshall Fund; James Sherr. 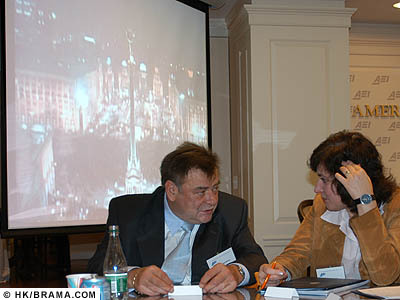 Keynote Speaker (2): Oleh Rybachuk, chief of staff for Viktor Yushchenko with Paula Dobriansky. Finally, with regard to the security of the region William Miller, former U.S. Ambassador to Ukraine, stated: "I don't see any invasions of one country into another in the nearest future. But the EU should move quickly [not to let it to happen]." In addition, Sherr warned of "some forces which will ensure that Yushchenko fails... Too much is at stake." That is why "after these elections the threat to the West will increase; it won't be reduced as many think." Impression from the Conference: Genuine Optimism or Misleading Predisposition? Overall the conference was held in an excessively optimistic spirit, not typical of rational and pragmatic analysts from Washington think-tanks. The overwhelming optimism at the conference corresponded with the momentous nature of the recent events in Ukraine. The passionate speech of Oleh Rybachuk, chief of staff for Viktor Yushchenko, especially intensified the emotional character of the conference. The speech received standing ovations and caused tears in the eyes of many. On the other hand, in the foyer, some of the attendants expressed the opinion that the conference was too optimistic. It their opinion, the reason for it was the one-sided representation of Ukrainian political forces. Orange color dominated the conference. However, those who hold this point of view misunderstand the nature of the struggle over the country. 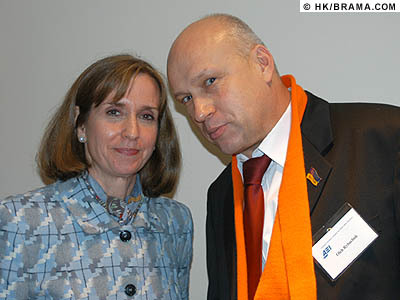 Orange color does not represent the interests of Western Ukraine. It just happens to be that Western Ukrainians more than Eastern Ukrainians support Yushchenko's Orange Revolution (and ethnic division is only one of many reasons for that). In fact, this struggle is not between the Ukrainian-speaking West and the Russian-speaking East. Instead, as Oleh Shamshur, Deputy Minister of Foreign Affairs of Ukraine noted, it is a battle of "free and fair elections versus fraud, democracy versus double standard rules, social life versus social indifference." That is why the conference can hardly be called one-sided, unless you agree on the presence of authoritarian ideas at the conference as a counterbalance. BBC footage of the November/December 2004 opposition protests in Kyiv's Ploshcha Nezalezhnist (Independence Square) on screen; Roman Kupchinsky, Anna Pidlusky in the forground. 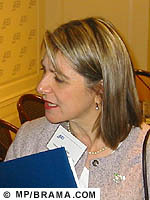 Myroslava Gongadze (pictured above), wife of murdered journalist Heorhiy Gongadze, believes that one of the first acts of the Yushchenko government must be to establish a commission that would investigate the criminal and corrupt elements from the previous regime. The nation must be assured that justice has been done for all of the suffering it has endured. 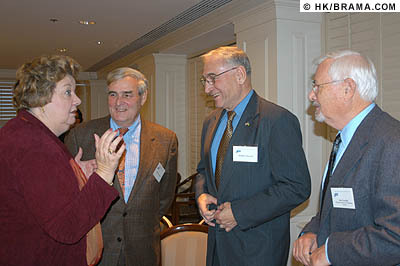 L-R: Nadia McConnell (President, US-Ukraine Foundation; William Miller; Nicholas Krawciw; Ihor Gawdiak, President, Ukrainian American Coordinating Council. 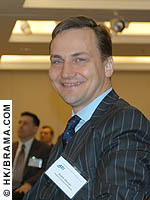 L-R: Olesandr Potiekhin - political counselor, Embassy of Ukraine; Radek Sikorski; Nadia Diuk. 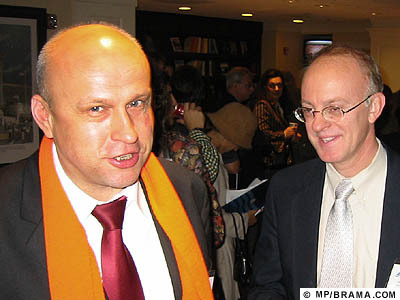 L-R: Oleh Rybachuk; Orest Deychakiwsky, staff advisor, Commission on Security and Cooperation in Europe. 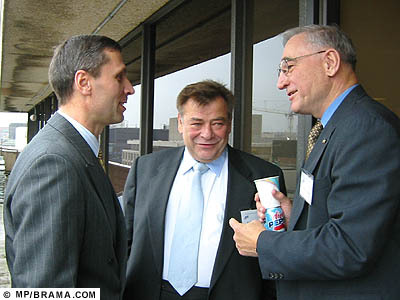 L-R: George Chopiwsky, Chopiwsky Foundation; Vera Andrushkiw, US-Ukraine Foundation; Radek Sikorski. Audio tapes - courtesy of the American Enterprise Institute, converted to digital format by Max Pyziur. Photos as credited. Images and content formatted for the web by Hanya Krill.